NOW AVAILABLE IN EPUB AND MOBI FORMATS (AS WELL AS PDF) FOR ALL OF YOUR DEVICES. "If your dog dictated how you spend your agility dollar, you'd be buying this book." Read more of what people are saying here. Whatever your sport, this is the book you've been waiting for. You've bought all the right toys and trained to perfection. You’ve read all the books and watched all the videos. You’ve closed the blinds and practiced your handling moves. You’ve honed your mental management routine and set goals that are reasonable and reachable. You tell yourself and everyone else that you’re in it to have fun with your dog. …toss competition into the mix, and it’s a whole new game. Ever wonder why? Or how to get that "perfect at home" performance in the trial ring? 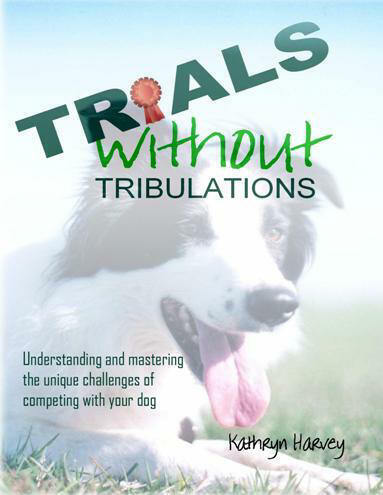 Practical, comprehensive and often just a little bit irreverent, Trials without Tribulations is a book you'll refer back to over and over. Full of advice applicable to any and all of the many sports in which people compete with dogs, this book will alert you to pressures you may not even be aware of and suggest ways to deal with them that both build on your relationship and hone your performance. No matter how close your bond, having an animal as a teammate presents a unique set of challenges, and the more you know about them, the better equipped you'll be to handle them in a way that enhances rather than strains your relationship. One part training, one part handling, one part mental game and a whole lot of evidence from a variety of fields, Trials without Tribulations will increase your awareness of all of the complications competing adds to your relationship with your dog. To the extent that performance is dependent on a solid and mutually rewarding relationship, increasing your understanding of the special pressures inherent in competition will help you to master them and improve outcomes accordingly -- whether those outcomes are measured in ribbons and Qs or the unbridled joy of perfect teamwork. For less than the cost of a single entry fee, you can add this great resource to your e-book library. Please specify the e-mail address to which you would like the book sent. Pay via Interac transfer to havoc@citizencanine.com, or by using the PayPal button below. Once payment is received, download instructions will be forwarded to you and you can choose the format you need. "Can't say enough about this wonderful, essential new piece of agility equipment. Love this book! So much to think about, thank you Kathryn!" "I just downloaded the book and was immediately enthralled - with the introduction!! I'm looking forward to reading the rest of it !" "...She echos and reinforces some of the things I have long believed about the cost of competition on our dogs but she goes much further than that, offering specific strategies to build resilience in the whole team and improve performance. I cannot think of one person who won't get something of value from the book. I know I will read it again and again." As a dedicated (some might say obsessed!) student of the relationship between people and their dogs, Kathryn has spent the last nineteen years gathering and applying knowledge about how to make the competitive experience the best it can be. Fascinated by the scientific principles that govern the process of learning, Kathryn has developed a sound and thorough understanding of behaviour modification -- the key to developing a program of positive training that is clear, consistent, fair and fun for every member of the team. After several years of teaching and assisting with obedience, tricks and agility classes in Toronto, Kathryn focused her teaching somewhat, first on workshops covering the amazing potential of clicker training and later on all things agility. Six very special dogs have served as Kathryn's in-house teachers over the years. Each has provided a range of lessons that together have created a cherished education. Currently living with two very well-loved border collies and a Zuckerberg shepherd, Kathryn has a great appreciation for dogs of all breeds and backgrounds. Backed by experience gained via Masters degrees in behaviour modification and business, a vast library of resources, and attendance at numerous conferences and workshops, Kathryn has been a prolific contributor to a range of publications, most notably DogSport magazine. Co-author of the sold-out book Citizen Canine: Practical advice on living with dogs in the real world, Kathryn continues to write about dogs and dog sports whenever the chance arises. Kathryn's experience as a competitor, instructor and trial host served her well during her two terms as President of the Agility Association of Canada. Kathryn continues to support the evolution of the sport in ways that will better meet the needs of competitors and their dogs.